If you have ever played the Rumble Rumble slot game, by Ainsworth Gaming, then you will immediately recognise the style of gameplay in Flying Horse. It is essentially exactly the same slot, but with horses, rather than bulls as the main character. Our free version here can be played with no download or registration required. Developed by Ainsworth Gaming, Flying Horse is one of several animal-themed video slot machines by the Australian provider. the game follows a standard 5x3 format and offers 100 paying lines than can be adjusted. Inspired by the magnificent noble stallion, Flying Horse slot features symbols like the Flying Horse logo which works like a Scatter, a canyon, a golden eagle, a red lucky 7, a horse in full gallop and a stallion up close, as well as a diamond. The special symbols are the blue Wild, Wild Flying Horse which can be both a Wild and a Scatter and the already mentioned Scatter game logo. Collect three of the Scatter logos and you’ll receive 8 free games, during which specific sections of the board will turn blue and red. If you land the horse symbol in the red section of the reels, a re-spin is triggered, independently from the free spins you may have left. However, if the horse lands in the blue section, it will turn into a Wild and possibly help form more winning combinations. The free games feature in Flying Horse comes with the possibility of re-triggering another 5 free plays. 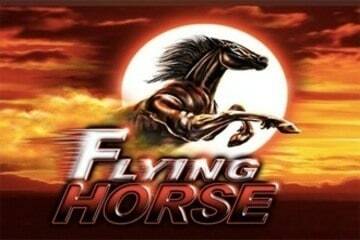 Flying Horse slot can be a high stakes game, and if you play it for a max of 10,000 per spin, you could earn as much as 1,000,000 credits for five Flying Horse symbols on a pay-line. If you happen to be a fan of Rumble Rumble slots, which was one of the first 'hits' for Ainsworth Gaming, you will almost surely like this one. My own opinion, though, is that this game doesn't quite hit the mark. Probably the main reason I don't feels any thrills when playing Flying Horse is that I can hit a full reel of wils symbols on rows 2, 3 and 4, including a horse symbol (one of the bigger ones) and still only make 4x my total bet. The thing is, you get so used to making a decent win when you get lots of wild symbols, or hit a 5 reel win on just about every slot you ever play, when you do it on this one and get almost nothing back, it's a real anti-climax. Of course, the pay-back on this slots must be quite high, because Vegas has minimum limits on such things, which makes me wonder when player actually hit a big win? If you live in the UK or one or two other European countries you can play this exact game online for real cash. However, if you live in the US, Canada or Australis, things are not quite so easy - you can play 'very similar' but not identical games, due to licensing restrictions. New Zealanders and Australians should appreciate the retro imagery of the Flying Horse pokie, and punters from the UK can undoubtedly enjoy the creative free spins round which characterises Flying Horse as not your average fruit machine. The Flying Horse slot is one of the more abundant games in Vegas made by Ainsworth. If a casino has this game, you will almost certainly see it or hear it, because the games are generally pretty loud and big. The main Flying Horse game is a 5x3 reel format, which then expands into an elongated slot when you hit a bonus, with extra wilds and bigger wins available. This game is one of the most successful slots made by Ainsworth and is in most Vegas casinos.